This is our Frankincense Steam Distilled Essential Oil from the Oleoresin. Herbal Folk Traditional uses for Frankincense include cosmetics, digestive disorders, facial rejuvenation masks, incense, nervous disorders, perfumes, respiratory infections, rheumatism, syphilis, urinary tract infections and skin disorders. Frankincense is valuable for skincare preparations that aid in the prevention of dry damaged skin, mature skin and wrinkles, in respiratory formulas, immune system support and for nervous depression. Frankincense has pain relieving and decongestant properties, instills deep tranquility to the mind and slows breathing making it a powerful meditation oil. It has a fresh clear aroma without any harsh notes. Frankincense blends well with Bergamot, Cinnamon, Clary Sage, Clove, Cypress, Galbanum, Geranium, Ginger, Jasmine, Juniper, Lavender, Mandarin, Myrrh, Neroli, Oakmoss, Patchouli, Lotus, Mandarin Petitgrain, Rosemary, Sandalwood, Thyme, Vetiver and Ylang Ylang essential oils. Frankincense gum and oil are both used in cosmetics, fragrances, perfumes and soaps. Frankincense is especially useful as an oriental scent lending a spicy scent to men's personal care products. Frankincense is also extensively used in incense. 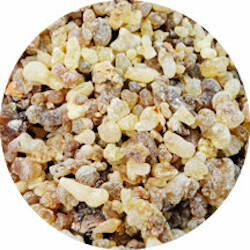 Frankincense is native to the Red Sea region and grows throughout northeast Africa. Frankincense Essential Oil has the following actions: anti-inflammatory, antiseptic, astringent, carminative, cicatrizant, cytophylactic, digestive, diuretic, emmenagogue, expectorant, sedative, tonic, uterine and vulnerary.